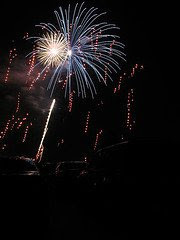 For July 2009 my Net Worth is $616,290 which is up $25,468 from the previous month. Thats a pretty good jump for one month. The net worth is a new record high. The main reasons it went up so much are increases in real estate values and retirement accounts. My house value jumped up quite a bit in the past month and our rentals also increased. The value of our house was up about 5% and the other property about 2%. My retirement accounts also grew pretty well and they were up about 5%. Cash and stock value didn't change a whole lot. I did actually sell some stock but the rest of the stock I've got has increased in value. I've even got some value in stock options now. Previously my stock options were not worth anything since the grant price was lower than what the stock was trading at. We paid half the bill to get our house insulation done so that ate up the profits from the stock sale. Free credit score and other services from Quizzle. Quizzle is a free service from Quicken Loans. You can sign up for a free account through their website. One feature that I think is really nice is that when you sign up you don't have to give them your social security number, which makes me more confident in the security risk. OK so what is Quizzle? From Quizzle's main page they say : "Quizzle is the only place that gives you a simple understanding of your home and your money, all in one spot. You'll get a free evaluation of your credit, home value, mortgage, budget and more, then get important tips on how to make the most of them (minus the confusing financial jargon)." Quizzle has a few nice features but the best reason to sign up is that they give you a free credit score. The score they use is a "National Equivalency Score" from the Experian credit bureau. So it should be noted that this is not an actual FICO score. The FICO scores are available for purchase at myFICO But for personal use I think a "FAKO" score is just fine to get an idea of how your credit is doing. In addition to the credit score you can also see a copy of your Experian credit report. You get a new credit score and credit report every 6 months. Quizzle gives you letter grades (A,B,...F) for your financial aspects including : Credit, Home Value, Mortgage, Budget and Rainy day fund. Then Quizzle combines all the financial data in to one overall Quizzle score which gives you an overall financial grade. These scores help you see how you're doing on your finances in general. How they grade them varies: For the rainy day fund their goal is to have 4 months living expenses. Home value grade is based on how much your home as appreciated or depreciated since you bought it. They get a estimate of the homes current value from CyberHomes. Given that home values have gone down recently, it would be no surprise for many people to have a low score on this category. If you have depreciation overall then you'll get a D or F. The credit score grade is straight basis of how your credit score compares to the population in general. The mortgage grade is a little iffy in my opinion. They seem to grade you based on how much you'd save if you refinanced more than anything. That is very dependent on the ups and downs of interest rates. Personally I think that comparing your debt to your total income would be a better measure of your financial health. My scores are pretty good. 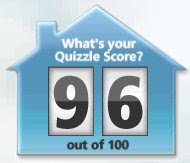 My overall Quizzle score is 96 out of 100. I got all 'A' grades except for home appreciation which is a 'B'. My home was bought 10 years ago and it has appreciated +50% in that time for annual increase rate of 4%. If you'd like another opinion then here is another review of Quizzle from the blog Stop Buying Crap. Overall I recommend Quizzle. Its a nice easy way to get access to a free credit score and their financial grades are a nice tool as well. Buried in the Budget of the US government documents there is information on our government receipts. One table includes receipts broken down by source as a % of GDP. I pulled out the figures for individual income tax and corporate income tax and graphed them post WWII era from 1944 to 2007. The two graphs are shown below. 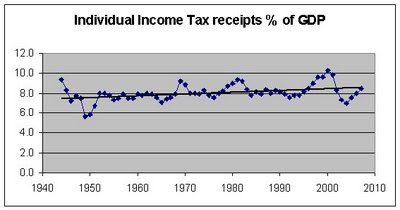 For individual income taxes the total receipts ranged from a minimum of 5.7% of GDP to a maximum of 10.3% of GDP. The receipts averaged 8.0% and the standard deviation was 0.83%. The median value was also 8.0%. In 2007 the amount was 8.5%, marginally above the historic average. The black trend line shows a gradual increase over time. 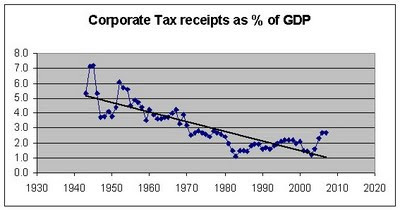 Corporate tax receipts as % of GDP ranged from 1.1% minimum to 7.2% maximum. The mean was 3.1% with a standard deviation of 1.45%. The median value was 2.7%. In 2007 the rate was 2.7% which is close to historical averages. The black trend line shows a fairly steep decreasing trend in the long term. I've heard of Prosper and Lending club for a while. Both are peer to peer lending institutions. If you're a lender you invest your money and it is loaned to individuals for various reasons. The benefit of these systems is the lender gets a relatively high return and the borrower gets a relatively low rate. I've thought it would be interested in joining to try it out. I can't lend money on Prosper or Lending Club and you probably can't either. Prosper and Lending Club are both limited to certain states and they have income and net worth restrictions. Prosper is only available in 16 states. 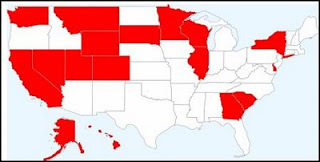 From their website : "Prosper is currently available to lenders in the following states: California, Colorado, Delaware, Georgia, Hawaii, Illin ois, Minnesota, Montana, Nevada, New York, South Carolina, South Dakota, Utah, Washington, Wisconsin and Wyoming. Also, Prosper is always working to make lending on Prosper available in more states, so please check back. " The graphic on the right shows the states that Prosper lenders can live in. Those states represent about 115 million people or under 40% of the total population. That means that over 60% of Americans aren't in states that are allowed to be lenders on Prosper. If you live in Alaska, Idaho, Kansas or Pennsylvania then you have to have 1) income of $70,000 and net worth of $70,000 or 2) at least a net worth of $250,000 and you can't put more than 10% of your assets into Prosper. For California you can't put more than 10% of your net worth into it and if you invest over $2500 then you need 1) income of $85,000 and assets of $85,000 or 2) net worth of $200,000. Those rules apply to about 54 million people and exclude about 27 million people. I'm making a rough estimate that about half the people have incomes and net worth below those minimums. In total 115 million people live in states that are allowed to lend on Prosper. The state specific income and net worth minimums exclude around 27 million of those people. That leaves about 88 million Americans who can actually lend money on Prosper. In total only about 30% of Americans are allowed to lend money on Prosper. So chances are you can't. California, Colorado, Connecticut, Delaware, Florida, Georgia, Hawaii, Idaho, Illinois, Louisiana, Maine, Minnesota, Mississippi, Montana, New Hampshire, Nevada, New York, Rhode Island, South Carolina, South Dakota, Utah, Virginia, Washington, Wisconsin, West Virginia, and Wyoming. Those states are home to about 154 million Americans. Lending Club also has income requirements but theirs appear to apply to all states. They require 1) $70,000 income and $70,000 net work or 2) $250,000 net worth. If you're in California they require 1) $100,000 income and $100,000 net work or 2) $250,000 net worth. The income restrictions would likely exclude half of the population. 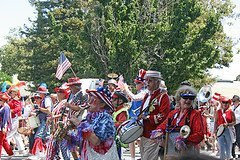 That leaves about 77 million Americans, or about 25% of the population, who can participate in Lending Club as lenders. About 75% of Americans are not able to be lenders on Lending Club due to state of residence or income limitations. About a year ago I wrote the article: Renting Solar Panels? In that I talked about a company named Citizenre that planned to rent solar panels to people with no cost other than the power of the electricity. Well a year has gone by and Citizenre doesn't seem like they have any concrete details or dates yet for when they would actually start renting solar. There is a company out there leasing solar panels to consumers and actively installing hardware. That company is SolarCity. They actually had a booth setup at our local Costco a while back. Before I go too far into talking about them I should note that it looks like they currently serve Arizona, California and Oregon. Solarcity will sell and rent panels to individual homeowners. Their SolarLease lets you pay them monthly payments on your solar panels over a 25 year period which is effectively renting them. Their website says a "typical" 3 bedroom home with an electric bill of $200 would get a 4kW solar system and then end up with electric bills from the electric utility of $65 and a $0 down lease of $115. Thats a $20 month savings. However I suspect that their 'typical' home is in a fairly sunny location. I ran the numbers for my own home and came out with a -$156 annual savings on their Solarlease. I'd be losing money on the lease setup. So their lease isn't going to work for me. Our electric is currently $175/month. The solarlease would be $41 and the new electric bill would be $147. However using their calculator defaults it said if I bought the system with cash it would cost $34,014 less federal, state and local tax and rebate incentives for final out of pocket cost of $10,132 and I'd save $336 a year on my electric. They calculate the ROI at 2%. In my last look at evaluating solar panels I figured that the 'sweet spot' to maximize my return would be a 2kW system. SolarCity's calculator seems to default to a larger 3-4kW system. I told their calculator that my electric bill is $25 and it put out a smaller cost system with final cost of $3,638 and annual savings of $168. Thats not the sweetest deal but not too bad either. It amounts to 4.6% annual payback and a 21 year payback period. SolarCity claims to be the largest installer of residential solar power in the country. Plus they have a lot of positive press including news of installations for major companies. I think their Solarlease system could be a great deal for people in sun drenched areas. If you're looking into solar then SolarCity is probably worth checking out. Recently my wife and I have been watching reruns of Friends on TV. She has never seen the show before and took a liking to it. However we've been frustrated that they run the episodes out of order and seem to skip key episodes. So we decided to buy the complete series on DVD. The plan is to buy the DVDs, watch them all and then resell them. I figure this is a pretty good way to watch the show at our own with relatively low cost. Amazon had some for sale fairly cheap but eBay auctions looked a bit cheaper. I started shopping around to buy the complete series on DVD on eBay. Over the past few years I've bought dozens of items off eBay and never had any real problems. Most sales work perfectly and I've been very happy with the experience. This time was different. I have high confidence that buying on eBay is safe in general but I've also tried to be cautious with who I buy from. There are definitely scammers on eBay unfortunately. I shopped around for a few days and placed some bids on some auctions but was outbid. Then the other day one seller had multiple copies of the series going for $40-70 range. That is a good price since other auctions were running $80-90 range mostly. The seller had 100% feedback with around 40-50 positive reviews and no negatives. The auction listing said they accept Paypal but don't "prefer" it. Nothing raised major warning flags for me at that point. I went ahead and bid and ended up winning the auction at $75. Warning sign #1: My first warning sign was when I was looking at the auction listing after I initially bid and I noticed that the DVDs were "unrestricted". Normally DVDs are restricted to certain geographies. DVDs sold in the USA / Canada are only usable on DVD players made for the US/Canada market. All the other Friends DVDs on the auctions were restricted to the US/Canada market. So I was a little concerned that the DVDs being sold may be 'greymarket' from some other country or worse, and more likely they could be forgeries. At this point I was hopping I would not win the auction. But I did end up winning it. So I forged ahead with fingers crossed that I wasn't buying a cheap forgery. Warning sign #2: The seller then sent me a invoice for Google checkout. I prefer to pay with Paypal so I went ahead and paid via Paypal. The seller then denied my Paypal payment and asked me to pay by Google checkout instead since they "HIGHLY" prefer it, but if not they'll take Paypal. Hmm... ok well I prefer Paypal and their auction says they accept Paypal so I'm paying with Paypal. I sent them a mail asking them to accept Paypal. Now I'm not really very happy with a seller that tries to argue me into paying outside eBay with his preferred method. If he doesn't want to accept Paypal then he should just not accept Paypal. Given the way the guy has acted thus far more warning bells are going off in my head. But I won the auction so I really have to proceed with the transaction at this point, since I dont' have any direct evidence of fraud or anything. Thats odd. I don't recall auctions being removed that soon after the auction ends. Oh, oh. That can't be good. Why would a seller be unregistered at that point? Thankfully the seller never actually accepted the Paypal payment. So the payment didn't go through. I guess he was still waiting for me to send money via Google. I went into Paypal and cancelled the payment. I then sent eBay an email asking them whats going on. I also sent the seller an email telling him that I'm cancelling payment on Paypal and asking him why he's no longer registered in eBay. Its been about 3 days since then and I haven't heard a word back. Only after the fact did I realize that the seller was using a PO box for their google account. I never followed the Google checkout invoice until after the fact, but when I do it gives a PO box for their address. Be Extra cautious with very cheap deals. The price seemed pretty cheap and I was wondering how they could be so much lower than everyone else. But I went ahead anyway. A low price alone should not keep you from buying on eBay. But a super "too good to be true" price should be a big warning flag. Generally a very cheap price should be reason for you to be extra cautious. Be more careful examining auction listings before bidding. If I had read the auction listing more carefully in the first place then I would have noticed that the DVDs were 'unrestricted'. I probably wouldn't have bid on them because of that. Be wary of people asking for alternative payment. If someone is explicitly pushing you towards a form of payment that isn't protected like Paypal then this could be a warning sign. Of course not all sellers who prefer alternate payment are con artists but its something to out look for. If a legitimate seller really doesn't want to take Paypal then they can simply not take Paypal. I think was only lucky that I didn't get ripped off for $75. Next time I'll be even more careful on eBay and hopefully continue my trend of successful purchases there. I really do like eBay and 99.9% of the people there are honest. Its the remaining .1% that you have to be wary of. Trent at The Simple Dollar tries out Amazon's Mechanical Turk : Can You Actually Earn Reasonable Money from Mechanical Turk? Disclaimer: Investing in individual stocks is risky and I wouldn't take my comments here as investment advice in any way shape or form. Yesterday I bought some shares of Bristol-Meyers Squibb (BMY) for my Roth IRA. I bought 25 shares of BMY today at $19.60 or $490 worth. Not a huge stake. Previously I mentioned that I had decided on a high dividend stock strategy for my Roth IRA. I've used this strategy for my 2008 & 2009 Roth IRA contributions, so thats $10,000 total. I had about $200 in cash around the start of the year and I've been accumulating some cash from the dividend payments. I had over $500 in cash so I decided to go ahead and buy something. 1) 6% yield on dividends -- My strategy for my Roth is to get high dividend paying holdings and build a cash flow plus hopefully gain in equity value. 6% yield is pretty good for a solid company. 2) PE of 7.5 -- They are trading relatively low given earnings. 3) Solid financials -- Their revenue and profits have been growing steadily in the past few years. They have more cash than debt. 4) I wanted to add pharmaceutical -- I didn't have any healthcare or drug related stocks in my IRA yet so I wanted to add something in this industry. I think health related businesses are only going to keep growing as the need for their goods and services will not go away. 5) They aren't a one-trick pony -- the company has several drugs on the market and many in development. So I'm not worried about their future depending on FDA approval of a single drug. Those reasons are not in priority order. The solid financials are a make or break decider for me. If a company doesn't have solid financials then I'm not buying it. The other reasons I bought all add up to make BMY more attractive to me than its peers. 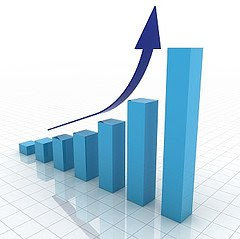 Overall my strategy has been to mix high quality individual stocks with decent dividends: AT&T (T), GE (GE) and Harley Davidson (HOG), high dividend REITs : HRPT properties trust (HRP) and Hospitality Property Trust (HPT) and high dividend ETF : Vanguard High Dividend Yield Index (VYM). So far GE & Harley Davidson have both dropped dividends significantly since I bought them. The HPT REIT suspended dividends and I'm not sure what if anything I'll get out of that one for the year. REITs have to pay out 90% of their profits in dividends but I don't know what they'll have for profits if anything. So far I've gotten about $300 in dividends from about $10,000 in holdings in the first half of the year. I'm on track for a total 6% annual return at that rate in 2009. Not bad. Since the press seems full of nothing but gloomy economic news for the past year or so. In honor of the 4th of July, I figured it would be nice to highlight some positive economic data. Gasoline prices are 37% lower now than they were this time last summer. The Housing Affordability Index rose 32.5% in the 12 months from May 2008 to May 2009. Americans are saving over 4% of their disposable income. Mortgage interest rates on 30 year fixed loans are 20% lower today than a year ago. Violent crime rates were down 2.5% in 2008. 90.6% of working Americans are employed. 92.5% of working women in the US are employed. 99.5% of banks are operating successfully in 2009. 99.75% of mortgages did not go into foreclosure in May 2009.